Deeson RV caravans have been designed in accordance with Australian Standards and are manufactured under the guidance and direction of experienced and qualified Australian tradespeople. Our primary manufacturing facility is located in Changzhou, China. Our production operations in China are overseen by our Australian based Production Manager, who shares his time between our main facility in China and our local facility in Sydney, Australia. 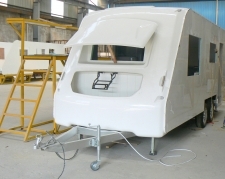 Our tradespeople in China, comprised of fibreglassing, carpentry, CAD drafting and other personnel, are regularly joined by our Australian team to ensure our caravans are manufactured to Australian specifications and that quality is maintained at all times. Every van is inspected and tested locally in Australia, prior to registration and distribution to our Dealers. As a member of the Caravanning and Camping Industry Association of NSW, we adhere to CCIA's Ethical Code and firmly believe in ensuring genuine quality and care in everything we do. For further information on CCIA NSW's Ethical code click here.